This Classic Cheese Ball recipe makes the perfect party appetizer. This cheese ball is made with cheddar cheese, cream cheese, green onion and spices, and coated in chopped pecans. I’m not sure how I have yet to post one of the most classic holiday appetizers, ever– an easy, peasy, yummy Classic Cheeseball! I shared these mini cheese ball bites a few years ago, and although they’re a favorite, you can’t beat the easy, deliciousness that is a good ol’ classic cheeseball. There are several things I love about this cheese ball recipe. 1. You can make it ahead of time–like, a week in advance if you want to (although I may add the nuts closer to when you serve so that they don’t get soft). It’s one of my favorite things to bring to a holiday party and it’s a Christmas staple at our house every year. The only problem with making it in advance is figuring out how to keep your family from eating it all! 2. It has great flavor and definitely isn’t boring. Not one specific spice overwhelms and all of the flavors in the cheese ball blend together nicely. Also, it’s worth noting that the hot sauce wont make it spicy, it just adds great flavor. 3. 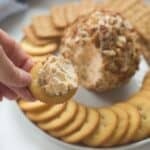 This cheese ball is perfect as a party appetizer while you prepare the rest of your holiday feast! It’s completely low maintenance. Just fix it up, pull it from the fridge when you’re ready, and set it out with a bunch of yummy crackers for people to serve themselves. Making a cheese ball is easy! Combine your ingredients (cheese, cream cheese, onion, Worcestershire, hot sauce, and spices and then form it into a ball. I love to coat my cheese balls in finely chopped pecans! 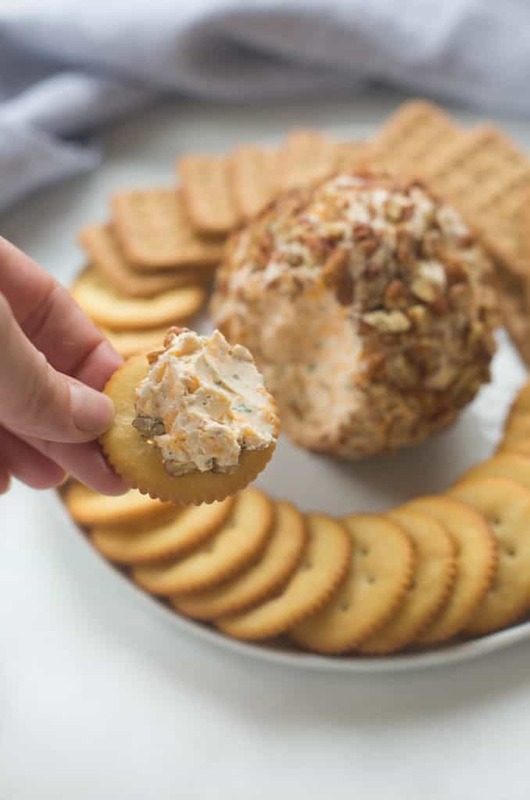 To make cheese a cheese ball bite, check out this recipe. How long does a cheese ball last? To estimate how long your cheese ball will stay fresh, first notice the expiration date on the ingredients you are using. Assuming you are using recently purchased ingredients, your cheeseball should last about 2 weeks in the refrigerator! This Classic Cheese Ball recipe makes the perfect party appetizer. 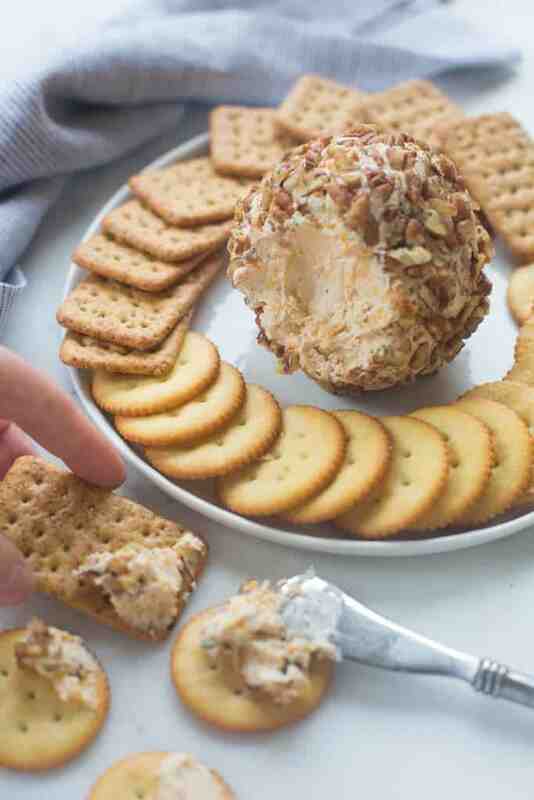 A cheese ball made with cheddar cheese, cream cheese, green onion and spices, and coated in chopped pecans. Place cream cheese in a mixing bowl and mix until smooth. Add cheese, green onion, Worcestershire sauce, hot sauce, parley, garlic powder, oregano and pepper and mix well to combine. Use a rubber spatula to scrape the sides of the bowl and gather the mixture into one lump. Lightly grease your hands and form the mixture into a round ball. Place the pecans on a plate. 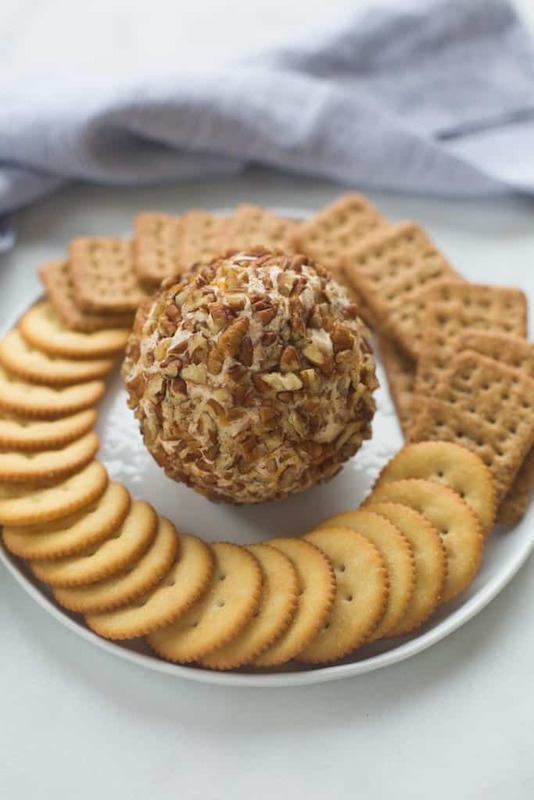 Hold the cheese ball in one hand and use the other hand to scoop the pecans onto the outside of the ball, pressing them in gently and turning the ball to coat all sides. Cover the cheeseball in cling wrap and refrigerate until ready to serve. Serve with crackers. RATE AND COMMENT BELOW–I WOULD LOVE TO HEAR YOUR EXPERIENCE! Out of pecans so used almonds. Used Jalapeno sauce. End result? Excellent! Thanks!